There's never been a shortage of handicraft in Star Wwars - from memory it was UK-based Letraset who kicked it all off in the late 70s with their dry-transfer dioramas. The momentum never waned and in the late Noughties the charge was lead by Lucasfilm alumni Bonnie Burton, who became a champion of the crafting cause. Nowadays with the Hipster counter-culture (finally) on the down swing it is the Maker Movement - a subculture best described as a technology-based extension of DIY culture - that is at the forefront of active learning, and its ambassador is fellow-Lucasfilm alum Adam Savage. Sadly this ex-ILMer, who is famous for his work on Mythbusters and his convention cosplay, was not involved in this book. That's not to say that the authors of i>Star Wars Maker Labs are lacking in any way. After having failed to discover midichlorians ex-research molecular biologist Liz Heinecke is now making it her mission to show the world that anyone can be a scientist, while sidekick Cole Horton has authored multiple Star Wars book - including Absolutely Everything You Need to Know and The Visual Encyclopedia - and helps develop Star Wars video games. So where is this all leading to? Let's start with the publishers own description and go from there. "Ever wanted to move things without touching them like a Jedi can? Or grow your own kyber crystal? Or maybe explode a balloon with a beam of energy, just like the Death Star? Now you can! 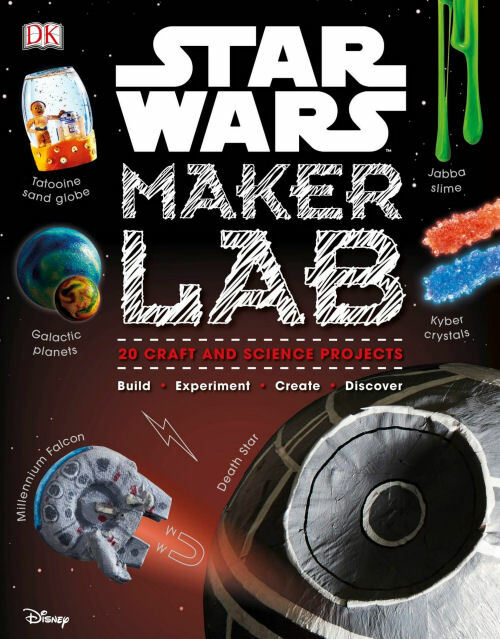 With 20 amazing projects, Star Wars Maker Lab teaches your budding Padawan how to become a Master of science, in both the real world and the Star Wars galaxy. Using clear step-by-step instructions, the book guides home scientists and makers through each exciting experiment–from making Jabba's gooey slime or a hovering landspeeder, to an Ewok catapult and a glowing Gungan Globe of Peace. Each experiment has fact-filled panels to explain the real-world science as well as the Star Wars science fiction from the movies. With projects that are out of this world, this fantastic Star Wars book can keep children entertained for hours, making use of many household items such as cardboard tubes, baking soda, cornstarch, straws, balloons, and food coloring. There is also plenty to keep more adventurous scientists enthralled, with instructions to make your own bristlebot mouse droid, lightsaber duel, and Mustafar volcano. Star Wars Maker Lab supports STREAM topics and helps children to learn the basics of science by traveling through the Star Wars galaxy. May the (static) Force be with you!" Inside and out the Star Wars Maker Lab is a richly illustrated book full of vibrant colours and engaging raphics, with snippets of learning tucked away where unsuspecting youngesters wouldn't expect. The twenty projects range from simple to less-than-complicated and all use the kind of materials you're likely to have around the house. Rather than waffle on about the virtues and failings of this book we let our resident reviewers OB1 and Luke, fresh from their review of LEGO Star Wars Ideas Book, pick out three activities to complete during a play date over the school holidays. The only conditions were that all the necessary parts and ingredients had to be immediately accessible (it was raining and none of us wanted to leave the house) and that all had to be done in a single day (as one of the Maker's schedule was beyond full). The brain trust got to work and after a short time they had their first selection made - Jabba Slime! What young boy doesn't jump at the chance to make slime? And when you combine it with Hutt gangsters it was an unanimous decision. Both boys dashed to the crafting box to dig out the slime making ingredients and before long they were getting stuck in to their first make. The next project was an easy choice; running low on energy the boys needed to find a boost and happened upon an obvious answer - the raw power of sugar in the form kyber crystals! After a frenetic hunt through the kitchen cupboards the necessary ingredients were located and deposited on the Table of Making. After a quick glass of blue milk and a plate of wookiee cookies our two budding Galen Erso's settled down and got stuck in. It wasn't an entire success though, because with such a hectic calendar Luke wasn't able to get back for a week and in that time the kyber crystals had set solid. But the solid block of sugar didn't go to waste and Luke was able to fulfill the desire he expressed at 1:43. Having realised that they had unwittingly supported the Empire's continuing subjugation of the galaxy OB1 and Luke decided that they had to make amends. Switching sides they threw their lot in with the Ewoks of Endor and joined the forces with the Rebels who were struggling to defeat the security forces protecting the shield generator bunker. Luckily for the embattled forces our two Makers knew how to make an Ewok catapult! The third build was the most time consuming and complex make of the day and the boys had to take multiple breaks to re-engage their enthusiasm. Both found the compact design difficult and the amount of wraps of string painful. You wouldn't have guessed from the jumble of string and twigs that one of the assemblers is a Grey Wolf-badged up Cub Scout, and the person typing this review is his Cub Leader. Though the end result worked and ultimately helped send Emperor Palpatine to his grave, I am sure Baden-Powell is spinning in his. And with three test projects of increasing complexity completed the boys were asked what their final opinion was. It's fair to say that in their eyes the making day was a success; they enjoyed the builds and though the outcomes were less than spectacular (which we can put down to dad being distracted by making the video clips rather than the makes) they still wanted to more. The wait for the kyber crystals to set played hard on their patience but both OB1 and Luke were as happy with their sweet rewards as they were with Star Wars Maker Lab, which is out now and available at all good book sellers.